The Honor My Wishes logo pictures a cairn, path and bird. A cairn is a stack of rocks marking a safe path to follow, a practice used by travelers since ancient times. Each of the following three sections include documents necessary to outline a path for loved ones to follow, assuring dignity, security and peace for an individual reaching life's end, represented by the bird in flight. Please Honor My Wishes for health care choices as set forth in my Advance Directive. To aid my Agent in making health care choices for me, I have recorded pertinent medical information and reflections on end of life care. Please Honor My Wishes for managing financial affairs and distributing personal belongings as set forth in my Will and other estate documents. To help accomplish the orderly transition of my affairs, I have recorded important information regarding my estate. Please Honor My Wishes for commemorating my life. To help complete this memorialization, I have designated a Funeral Agent, recorded my wishes for final arrangements, suggested funeral plans and how I wish to be remembered. The Honor My Wishes (HMW) Guidebook is written with Washington State law in mind, and is not intended to substitute for professional medical, legal or financial advice. The HMW Guidebook suggests recording information regarding personal identity. It is important that you store this Guidebook in an accessible but secure location. No part of this HMW Guidebook may be reproduced or transmitted in any form or by any means, electronic or mechanical, including photo-copying, recording or by any information storage and retrieval system without written permission of Honor My Wishes®. For those individuals filling out this HMW Guidebook, it is permissible to copy any and all pages with forms intended to be completed by the owner of the HMW Guidebook. Copying for educational purposes is permitted, with prior written permission of Honor My Wishes®. You may copy without prior written permission the Health Care Power of Attorney and Directive (HCPAD) and the Body Disposition and Funeral Agent Authorization forms. Contributions to Honor My Wishes are appreciated to help keep our products affordable to all, and are tax deductible. EIN#77-0599945. Every life is unique, and so it is with life's end. Whether a moment in time or a decade long, everyone will experience "life's end". What will yours be like? Are you going to leave it to chance? Your stewardship of planning for end of life can make a fitting end to your 'Golden Years', not only for you but for your family and loved ones. Unfortunately for some, their end of life may be the longest, loneliest and most challenging time of life. This Honor My Wishes® (HMW) Guidebook helps individuals make or direct choices regarding end of living decisions for themselves or a loved one, bringing dignity, security and peace to life's end. Addressing everyday obligations of a hectic lifestyle becomes a comfortable excuse to avoid weighty questions involving your death. This is not an easy task, but is a necessary one. Difficult conversations are easier to deal with while we are healthy, before being forced by circumstances. Legal documents can only be signed by those with competency, and should be addressing future needs and not past failures to act. Some families are torn apart by the difficulty of caring for a failing parent or the handling of an estate distribution without the owner's guiding hand. The issues facing an individual or their family at end of life can be wide-ranging, with a multiple of variables. While you cannot foresee all possibilities, this Guidebook covers the needs most people will encounter. Implementing even a part of this Guidebook will take substantial time, energy and thought, but the outcome will be rewarding. It is meant to be thorough and comprehensive, and a quick review should include at least the pages marked in the top right corner with our mini-logo. Our Guidebook is the proud accomplishment of many individuals residing on the Enumclaw plateau in Washington. There are several organizations that made the HMW project successful, and significant contributions were made by the Robert Wood Johnson Foundation - Last Acts Partnership & Rallying Points, St. Elizabeth Hospital located in Enumclaw, and the Franciscan Foundation. Technical assistance was provided by Respecting Choices® of LaCrosse, Wisconsin, and Anne Crandall Graphic Design. We are a non-profit corporation, and have operated since our beginning in 2001 solely with volunteers. Even without paid staff, we incur expenses of providing speakers and programs, and in the further development of this Guidebook. We appreciate your tax-deductible donations. Please consider contributing financially or with in-kind services to help us grow. Please note this Guidebook's focus is for Washington State, although we provide resources on a national level and the concepts covered are universal. Washington State allows for two individuals under certain circumstances to register as domestic partners, granting them many rights similar to married couples. The terms spouse, married couple or spouse/partner means to include 'state registered domestic partner'. We do not endorse any one decision over another, take responsibility for your choices, nor guarantee the services of organizations mentioned as resources. Every municipality, county and state are unique in their laws and regulations, and you must familiarize yourself with the rules of your own locale. With so many different cultures mixing in our country, there are a host of ideas for dealing with end of life. What ideas do you wish for yourself? morning breeze, and starts for the blue ocean. She is an object of beauty and strength, and I stand and watch her until she hangs like a speck of white cloud just where the sea and sky come down to meet and mingle with each other. Then someone at my side says: "There! She's gone!" Gone where? Gone from my sight-that is all. She is just as large in mast and hull and spar as she was when she left my side, and just as able to bear her load of living freight to the place of her destination. Her diminished size is in me, and not in her. And just at that moment when someone at my side says: "There! She's gone!" there are other eyes that are watching for her coming; and other voices ready to take up the glad shout: "There she comes!" often attributed to Henry Van Dyke, with several other poets considered possibilities, or was considered anonymous. Research in recent digitization of older works discovered this as published in Northwestern Christian Advocate on July 13, 1904 (and in two other publications as well), written by Beecher and titled "What is Dying". We expect our personal dignity to be respected and honored at every stage of life. This is especially true regarding our personal health care needs and choices. As long as we are able, we control the choices for medical treatment and the plan of care related to any illness or injury we face. We can complete an Advance Directive (AD) for those times we are unable to make a decision, but it must be done prior to any incapacity. As we face end of life, medical decisions become difficult. Harder still is leaving the decision to someone else. Who will make the decisions for you? Will it be a group of people arguing amongst one another over what is right and what is wrong? Will the decision maker agonize over choices, not really knowing what you might have wished for? Whether or not your loved ones can handle your medical choices at life's end in a dignified manner will depend on your AD and the discussions you have with your Agent and loved ones. stages of life - others are directing the care for them. The proclamation "My family knows what I want" or "No heroics" are common reactions in conversations about dying. Both statements are inadequate to guide loved ones in making life-sustaining treatment decisions on your behalf, and demonstrate an unwillingness to be responsible for your own future. You may believe these issues are addressed by a Health Care Directive to Physicians, also called a Living Will. Unfortunately, a Health Care Directive / Living Will by itself has been demonstrated to be ineffective. There are many reasons, but in general it does not address the circumstances under which most of us will die. illness by completing a thoughtful AD, and naming someone to make health care choices for them. The person you name is referred to as an Agent. Without an Agent, the priority order of those granted legal authority to make decisions on your behalf may not be the person(s) you would choose. It is first your court appointed Legal Guardian if any; then your designated Agent if any; then your spouse or registered partner; then your adult children; then your parents; and then your adult siblings. Since we cannot predict when we might need one, it is important that every adult over 18 take the time to thoughtfully complete an Advance Directive naming an Agent. Health Care Directive / Living Will combined. For other states see Resources: Advance Directives, pg. 67. Sustaining Treatment (POLST), may be appropriate (see Dignity page 4). The POLST puts your specific wishes for life sustaining treatments into a physician order, instructing what first responders should do in emergencies. The Living Will, known in Washington as a Health Care Directive, was an early attempt to address end of life care. Alone, this document is restricted in scope and does not address many issues and decisions faced at the end of life. IMPORTANT: If the documents you have carry only the title of Health Care Directive or Living Will, you need to complete a Health Care Power of Attorney. Each state has their own rules for Advance Directives. HMW created a Health Care Power of Attorney and Directive (HCPAD), an Advance Directive for Washington State, provided at the end of this section. It combines the legal language of the Health Care Directive (Living Will) with a Health Care Power of Attorney. This HCPAD gives directives to your doctor and appoints an Agent to make medical decisions for you if you are unable to answer for yourself. Completing the document takes only a few minutes, but a thoughtful process will make the document more powerful. It takes time to select the right person to act as your Agent. You should consider your present health condition and what kind of health care decisions your Agent may need to make for you. Reflect on your personal values and goals, and what it means for you to have a meaningful living existence. Your document will more probably be honored if you discuss it with your doctor, your Agent and loved ones. Without those discussions, there likely could be difficulties. out the words in question. Initial all changes prior to signing. Select your primary and secondary Agents. Carefully consider the person(s) whom you would trust to make medical decisions for you. Talk with them about this responsibility and secure their willingness to act on your behalf. Name a back-up Agent. Clearly write names and list all contact information. Review if conditions change or at least every five years. CANNOT be employees of or acting as your health care professionals. CANNOT be related to you by blood or marriage. CANNOT have any claims against you, nor have interests in your estate. Commencing 2017, signing a Health Care Power of Attorney requires either notarization or witnesses as above. Until 2017 this document need not be witnessed or notarized, but a Notary does provide for greater acceptance and may be required in other states. The Notary can be one of your witnesses. Documents done prior to 2017 will remain effective after the new law commences. Retain the original for yourself, and store in an accessible location. An option is for your primary Agent or doctor to hold the original. Deliver copies to your primary doctor, and your primary and secondary Agents. Consider online registration. Resources: U.S. Living Will Registry, pg. 62. If you later wish to change any aspect of your HCPAD, you will need to complete a new document. You may revoke your HCPAD at any time by giving verbal or written notice to your doctor and Agent(s). You should seek the return of the original and all copies of a revoked HCPAD, destroy the copies, and write “VOID” over your signature on the original. No hope of brain recovery. Permanent inability to recognize those around you. No independent ability to move. Total reliance on life support equipment. The POLST form replaces the older “EMS – No CPR” form in Washington State. The POLST is for use by any adult with a serious health condition who wishes to have their Advance Directive choices for life-sustaining treatments (cardiopulmonary resuscitation, use of antibiotics, artificially administered fluids and nutrition, and general medical intervention) documented as an actual Physician Order. Because first responders, such as a 911 medical unit, are obligated to provide treatment on an immediate basis without checking for the desirability for medical care, a POLST is useful as it will require that medical treatment be limited to the level prescribed by the patient and doctor. This document is prepared and signed by you, or your Agent if you are incapacitated, along with either your doctor, physician assistant (PA) or licensed nurse practitioner (ARNP). POLST forms are often available through your provider. Resources: Washington State Medical Association, pg. 67, National POLST, pg. 68. Completing the Health Care Power of Attorney and Directive (HCPAD) establishes who will speak for you. It provides little in the way of painting a picture of what your personal values and goals for your life may be, or what it means for you to have a meaningful living existence. An optional addendum to your HCPAD attempts to provide a written personal statement to clarify the parameters around which you would choose or deny treatment choices. It could help your Agent and physician develop a better idea of what your life wishes might be in a given situation. Additionally, consider an addendum an opportunity to share your feelings about your trust in and love for those who will be involved in making very difficult and possibly painful decisions. While completing this personal addendum can be a very emotional experience because it causes us to reflect on our own dying, the measure of love and peace it can provide to those who read it is beyond anything “legal” that we prepare. The American Bar Association has a downloadable Tool Kit for Advanced Care Planning, which will aid individuals in writing an addendum. Resources: American Bar Association, pg. 63. REMEMBER: No addendum can outline precisely what to do in every circumstance. These documents do not replace actual meaningful conversations with your Agent about your personal values for life and living but can provide some helpful direction. On pages 7 and 8 you will find four sample addendums to review. You are welcome to copy or borrow from these samples in creating your own personal addendum. Review Life-Sustaining Treatments - Benefits and Burdens on pages 9 and 10 to make yourself aware of the life-sustaining measures that may need to be employed. Life-sustaining treatments include any procedure or treatment intended to sustain biological functioning. All offer potential benefits and burdens as a result of treatment. Review Reflections Regarding Quality of Life on page 11 for some introspection on difficult issues. Address your addendum to the person(s) who will read it. What would you want them to know about your trust in them, your feelings for them and a final message to them? Take time to review your addendum with your Agent and physician if appropriate. It may provide the necessary springboard for clarifying conversations that could prove to be very important. Sign and date your addendum. Make copies and include it with each HCPAD you provide to others (hospitals, physicians, family, your Agent, etc.). The following four examples may provide insight for your own ideas and feelings you may wish to incorporate in your Advance Directive Addendum. Again, remember to think what would you want them to know about your trust in them, your feelings for them and a final message to them. I do not wish for those who have been designated as Agents for my health care decisions to agonize over whether or not to provide extraordinary means of treatment to sustain my life. I am not afraid of dying and wish to do so with dignity. I wish for the best available comfort care and pain management you can provide, but if my condition is designated as terminal or in a permanent unconscious state, I do not wish to be sustained on life support or other expensive treatments. If the doctors assess that there is a reasonable chance of pulling through a critical illness (that is not terminal) I am open to being on a respirator and receiving CPR. There are many variables and “what if ” scenarios. I ask that my Health Care Agents do the best they can but not agonize over their decisions. My Health Care Agent has full authority to determine whether life-prolonging support measures should be initiated for a trial period in treating my condition or illness. These measures include but are not limited to, artificial feeding and hydration, respirator/ventilator, CPR and antibiotics. They have authority to establish a termination of such trial life-prolonging support measures in the event it is determined my ability to recover and regain meaningful life existence is unlikely. My Agent understands that for me, meaningful life existence can be measured by my ability to communicate with and recognize family and friends, and my capacity to be responsive to people in an emotional, feeling way. I want any pain and symptoms managed in a way that will keep me reasonably comfortable, even if additional pain medications may hasten death. On a pain scale of 1-10, with 1 being no pain, reasonably comfortable for me is in the range of 2-4. Additionally, I wish to die at home if at all possible. If not, I prefer an Adult Family Home to a Nursing Home. I would appreciate a Catholic priest to visit and administer the Anointing of the Sick, and if possible, Holy Eucharist. I want my loved ones to know how very much they have meant to me and how much I love each one of them. I hope they will remember the times I have demonstrated this love well, and not as much the times I have failed to do so. I hope I will be remembered as someone who tried to love and serve the Lord in everything that was given to me. I trust my Agent to make the best decision possible in whatever circumstance is faced, knowing that my final trust is in God, who makes all things right. As my named Health Care Agent you have been part of ongoing conversations with me and my family about my wishes for medical care and treatment should I become unable to participate in the decision making process. Please know that I fully trust your ability to make choices for me based on our conversations. I hope this addendum provides some further assistance for you and the physicians involved in my care. The ability to communicate (either verbal or non-verbal) and connect emotionally with those around me. The ability to recognize family and friends. The ability to enjoy and respond to my environment. The ability to swallow and breathe on my own. I love my family very much and do not want this time to be any more difficult than it already is. Please know that I believe I am in God’s hands and that dying is a natural part of living. If my condition becomes terminal and it is clear I will not recover, I would like to die with as much comfort and dignity as possible. I do not wish to undergo any unnecessary tests or procedures. Pain control is very important to me and I would like to have enough medication to keep me comfortable, even if it will hasten death. Not being able to breathe scares me. If my condition is such that my ability to breathe is compromised, non-invasive measures and medication to ease anxiety would be welcome. I enjoy music and would like it to be part of my comfort care. I do not want to be alone when I am near death. Human touch is important to me. You may donate my organs. I would like to be at home, if it would not be a strain on my family, or in an adult family care setting with hospice support for myself and my family/caregivers. My Dear Loved Ones, I trust you completely to make decisions regarding my medical treatment in the event I cannot participate in the deliberations myself. I ask you to give consideration to the quality of life not only for myself but whether I would be of meaningful value to my family. For me, life may still have value, even if my mind is not present, if my grandchildren or great-grandchildren would have the opportunity to have met me and I am not overly burdensome to care for. I do not mind being in a nursing home as long as I am pleasantly disposed, and you indeed would bring the children to visit. However, I do not want to be kept alive if I become an angry, belligerent or demented person and the only memory the grandchildren or great-grandchildren would have would be negative. Additionally, please remember life can be pleasurable for me as long as I can watch sports on television and play solitaire. However, if I cannot recognize the teams that are playing, begin to cheat at solitaire, or, God-forbid, begin to think soccer is football, please do not treat any illness I get. Any treatment that maintains life for an individual is considered a life-sustaining treatment, which can range from complicated surgery to taking antibiotics. The treatment can be considered beneficial if it will likely prolong life and if it will restore some standard of health. It may be considered burdensome when weighing the cost of treatment, if the treatment does not restore an acceptable range or standard of health, if significant pain is produced, or even if the end result is psychologically harmful. The following are some intended benefits and potential burdens of several different types of treatment options. Used for reviving a person when their breathing and/or heart has stopped. In healthy individuals with no underlying illnesses, success rates are 40% or better to return to previous standard of health. Adults hospitalized with serious life-limiting illnesses such as cancer, diabetes, or previous heart damage generally have less than 5% chance of surviving and returning to the previous health condition. CPR involves chest compressions, which may break bones, complicating recovery. A tube is inserted into the larynx via the mouth or through an incision in the throat, and mechanical breathing is maintained by either a machine (respirator), or manually with a hand bag. Normal breathing rhythms are maintained, and the exchange of oxygen allows the lungs to recover from injury or infection. This can provide for permanent breathing support. Individuals with chronic lung problems generally never recover to their previous health condition. Provided via a tube in the veins, through the nose, or surgically embedded in the stomach. Allows for nutrition and water support during a period of time when the individual cannot feed or drink for themselves. Can be maintained indefinitely. In patients who are approaching death and whose organs are shutting down, artificial food and fluids are often not properly handled by the body. Sometimes this causes a variety of complications and possibly severe discomfort. A surgically embedded feeding tube may be difficult to remove depending on particular circumstances. Used to treat infections and return the individual to their prior state of health. Depending on underlying health conditions, a decision not to treat a secondary infection may be considered. Two examples are treating the pneumonia of a severe Alzheimer’s patient or the urinary tract infection of a cancer victim approaching imminent death. Choices are dependent on understanding the patients’ goals for how they want to live out the remainder of their life. The removal of bodily waste from the blood by machine or by fluid passed through the belly. When kidneys stop working properly, the body builds up waste in the blood. Dialysis replaces the work of the kidneys and prolongs life. Dialysis is especially important for individuals appropriate for a kidney transplant. Dialysis requires a commitment of multiple times a week. The process of dialysis often leaves the individual exhausted. Patients not appropriate for kidney transplant may decide that dialysis treatments and the life-long commitment required are no longer worth it. Procedures are intended to return the individual to their prior health condition. Major surgery may be too disruptive emotionally or psychologically. For example, consider whether you would want surgery for colon cancer to extend your life if you are a patient with advanced Alzheimer’s. Depending on your current medical condition and how you feel about these treatment choices, you may wish to talk with your primary care provider about completing a POLST (see Dignity page 4). More clearly than any other document, the POLST directs care providers to provide only the level of support you want. POLST forms are available through your provider. Resources: Washington State Medical Association, pg. 67; National POLST, pg. 68. The circumstances surrounding your particular injury or illness are unpredictable, and may vary from creating only short-term complications to permanent mental and physical disability. These reflection questions are intended to assist you in developing a description of what “quality of life” means to you. By putting your description into the words of a personal addendum for your health care directive, then taking the time to discuss it with your Agent, you will increase the likelihood your wishes will be honored regarding life-sustaining treatments. How willing am I to accept assistance managing my finances, appointments, and daily living errands as long as I am aware of the time and date? How willing am I to accept being wheelchair bound, as long as I am aware of the time and date? How willing am I to accept the assistance of others to feed me as long as I am aware of the time and date? Being kept alive through a feeding tube? How willing am I to accept being dependent on others to assist me in getting out of bed independently, bathe and dress as long as I am aware of the time and date? Being permanently bedridden? If I am permanently brain damaged and unaware of my own name or those of my spouse / partner and children, unable to remember the time, date or place for less than 5 minutes, would I desire life-sustaining treatment? Would I prefer to be fully sedated to the point of not being able to interact with my environment in order to be pain free, or tolerate some pain if there were any chance of becoming conscious again? Where would I like to die – my home, a hospital or some other setting? What important personal belongings, such as artwork, photos, etc. would I want present? Who would be important to have present at my dying, and should my death be delayed for purposes of travel concerns for others in order for them to be with me at the time of death? Should pets be present, and what comfort therapies like music or massage would I hope for? What final messages would I want to share with my Agent and loved ones about the difficult choices they may face in handling my health care? Most people support the concept of organ and tissue donation, but don’t sign the documents necessary to make it happen. Over 90,000 people in the United States are waiting for a lifesaving organ transplant. There is no cost for donation, your funeral plans do not have to be altered and you have the potential of impacting the lives of up to 50 people with your donation. If you have chosen to become a donor, please discuss this with your family and Agent(s). Resources: Organ and Tissue Donation, pg. 68. IMPORTANT: A body must be maintained on life support for several hours to allow sufficient time for the retrieval of organs. Medical history and physical condition at the time of death determines what organs and tissues may be donated. Donating your body to medical science and education can be a meaningful way to leave a final gift to humankind. People choose body donation as an alternative to costly funeral plans, as cremation is included at no cost. Individuals have two body donation options: medical schools, or private and non-profit corporations. “Willed Body” programs generally refer to plans made in advance by the individual with an institution, and “Whole Body” is when the family donates after death. The Body Disposition form at the end of the Peace section may be used for either program. Each program operates differently as described below, so be certain your family knows and understands your wishes. Resources: Body Donation, pg. 67. Registration does not necessarily mean your body will be accepted. The donation may be refused, so you must have alternate burial plans in place. Charges for transporting the body to the school may apply. You may not be an organ donor prior to your body going to the school. Your body remains under the jurisdiction of the school. At the conclusion of their studies, which may take up to four years, all remains are cremated and disposed of according to plans made in advance with the family. The return expense for cremated remains within the continental United States or Canada is paid for by the school / university. These organizations facilitate the placement of non-transplantable human organ and tissues primarily for medical science and education research worldwide. Transplantable organs and tissues may be retrieved and donated prior to the body being received by the agency. Most individuals are accepted regardless of age or illness. Generally costs for transportation and cremation are assumed by the agency. You may be an organ donor prior to your body going to the agency. Parts of the body used for research may be sent worldwide and are not returned. Unused body parts are cremated and returned to the family often within two weeks. When we are faced with a life-limiting illness and have previously been independent, it is overwhelming to begin navigating the health care service options. This brief outline of agencies, boarding arrangements and health care options can be a starting place. Consult your primary care provider, county Senior Assistance office, local Senior Center, library or U.S. Administration on Community Living. Resources: U.S. Administration on Community Living under U.S. Dept. of Health and Human Services, pg. 62. Apartments designed for and serving only senior residents. Low-income apartments provided under Federal Section 202 may require a long wait list. Senior apartments typically provide a higher level of privacy and fewer services such as laundry or housekeeping. These facilities generally provide a range of services for those who need supervision and help getting through the day. Some facilities are willing to help coordinate your care at life’s end with additional outside support such as hospice or private-pay aide time. Assisted Living Facilities may involve a long waiting list and making a deposit. Studio, one or two-bedroom apartments. A variety of meal plans, housekeeping and laundry services to choose from. Varying levels of assistance with health care and living issues depending on the facility and the plan you choose. May also provide limited local transportation. Enough staff support for individuals requiring a lot of care due to incontinence, advanced dementia or Alzheimer’s, or who require assistance with transfers from chair to bed, toilet, etc. Adult Family Homes are residential homes licensed by the state to care for two to six residents. Increased caregiver time to client. Often willing to keep a client until death. These hospital-like facilities provide short and long term care for patients recovering from an acute illness or accident, or for those needing significant services at the end of life. Skilled nursing care, physical and occupational therapy. These are privately owned complexes which charge one large up-front fee. They provide graduated living options responding to the level of care required at different stages, moving from independent apartments to assisted living units to a nursing home. Generally residents must be healthy when they first sign on. Most insurances, Medicare and Medicaid may cover some of the cost of Home Health Care, if the service has been prescribed by a doctor, is provided by a certified agency and the patient is essentially homebound. Nurses, Social Worker and Nutritionist. Physical, Occupational and Speech Therapists. The philosophy of hospice is one of comfort-focused care for people with an illness limiting life to six months or less, although hospice care can extend well beyond six months. Hospice teams typically can include a medical director, nurse, home health aide, social worker, psychiatrist, nutritionist, physical therapist, occupational therapist, chaplain and volunteer, all working to provide the best possible quality of life for the patient and family. These services may be provided in your private home, assisted living, nursing or adult family home. Expenses are covered under Medicare Benefits, and are often covered in most health insurance plans. Resources: National Hospice and Palliative Care Organization (NHPCO), pg. 65. Medications and equipment related to the terminal illness. Emotional and spiritual support for patient and family, including bereavement. Coordination of care with other care-givers, including volunteers. Education and training for loved ones in the skills required to meet the changing needs of the patient. Short term respite care to relieve fatigued care-givers. Medicines and equipment not related to the terminal illness. Caring for a declining loved one can be a vastly rewarding but significantly exhausting endeavor. A caregiver must pay close attention to their own emotional and physical needs to avoid burnout and isolation. Senior Centers are good local resources to ask for referrals to support groups, and investigate daycare and transportation options. Sometimes it seems no matter what the caregiver does, they are met with disapproval from the patient or other family members, so getting outside authority for decisions and extra help is advisable. Even if a caregiver chooses to donate their services, they should consider a “Contract Service Agreement” outlining expectations. This may be important later for reducing the value of an estate for Medicaid purposes. Consideration of estate issues is covered in the Security section. Resources: Eldercare Locator, pg. 61; U.S. Administration on Community Living under U.S. Dept. of Health and Human Services, pg. 62. What do you want to achieve or avoid? The answers to this question are your objectives. How will you go about achieving your desired results? The answer to this you can call strategy. Many of us do not take the time to organize our legal and financial documents and record critical facts. Have you taken care of your estate needs to provide your survivors the knowledge and ability to honor your wishes, or might you be leaving a bit of a mess? Each of us should take responsibility for the security of our affairs at life’s end, and by properly planning avoid significant anguish for your loved ones. There are many issues that may surface during these times, and this section of the Guidebook assists you in arranging valuable information to handle these affairs. Having your legal and financial information updated, organized and easily accessible is a gift for survivors. A Durable Power of Attorney names an Agent to manage your finances and assets and remains effective in the event you become incapacitated. It’s effective date can even be limited only to when you do become incapacitated. It can avoid a guardianship, and may even minimize the need for a probate. This financial Agent may be a different person than your Health Care Agent. You may choose to have your Agent keep the original, and you should consider having more than one original. A Will ensures that your assets will be passed according to your wishes. Not having a Will complicates the probate process, and may raise unnecessary hardships. Rights of Survivorship: Knowing which of your assets can be transferred without a Will, such as accounts held with Rights of Survivorship, is essential. Having important information gathered in one location will enable the individuals working on these problems to efficiently secure your estate. A Community Property Agreement between spouses/partners can convert separate property to community property and transfers community property at death to the survivor, avoiding probate. List: Attorneys, accountants, financial advisors and insurance agents might have a role to play, and their names and contact information should be readily available. Provide additional pages where necessary so that all of your relevant information is available. These and other legal documents identifying important information about your assets will be necessary to make effective transfers. You may wish to place copies of these documents directly into the Guidebook, or indicate where they may be located. For information on protecting yourself from Identity Theft, see Resources: Federal Trade Commission, pg. 61. Your family and loved ones will truly benefit by your thoughtful preparation. There are many issues concerning Powers of Attorneys (POA), Durable Powers of Attorneys (DPOA), Guardianships, Wills and Probates, so seeking advice or information from an attorney, the library or internet is advisable. The information below is not meant to be, or substitute for, legal advice; however, a few comments could be helpful as to why the following documents are valuable. In the Dignity section we learned half of us will not be able to make a medical decision at the end of life. If we cannot make a medical decision, we will likewise be unable to make a financial decision. It may be advisable to have a Durable Power of Attorney to protect your estate. As the Principal you may appoint a person, called an Agent, as your Power of Attorney (POA) to sign your name to contractual transactions and to handle your assets and finances. Such a POA automatically becomes void in the event you become incapacitated, or upon your death. A Durable Power of Attorney (DPOA) remains effective even if you become incapacitated. A DPOA can even be written so that it becomes effective only upon the incapacity, although complicating issues may arise with this provision. Within certain limitations, a person with a Durable Power of Attorney can have assets transferred to the healthy spouse/partner, entitling the incapacitated person to Medicaid, and protecting the incapacitated person’s assets from attachment. Such a DPOA can also transfer assets prior to death, avoiding the necessity of a probate. When a person becomes incapacitated, and their legal, financial or estate affairs need to be handled, one course of action is to start a Guardianship. A Guardianship is a public court case, generally involving attorney’s fees and possible litigation, and is subject to a judge’s control. The proper documents can avoid a court case and control the issues. A Health Care Power of Attorney, as the HCPAD in the Dignity section provides, can handle the important health care decisions for you. A DPOA can handle your financial and estate matters, avoiding the need for a Guardianship. Both of these documents are very powerful tools. When you die, your property passes on. A Will directs how this is to occur. Generally you do not need a Will if you have no significant assets at life’s end, if there is no prospect of assets coming into your estate after you die, or if all your significant assets or real estate are held with Rights of Survivorship. However, for those who possess some significant assets to be handed down, the most common procedure to accomplish this is with a Will. Married or registered couples in Washington State may wish to also use a Community Property Agreement as discussed on page 22, although you should receive legal advice before signing such documents. Having a Will avoids apprehension regarding the distribution of your assets, as a Will can answer many questions. It shows you care your beneficiaries receive your assets in an orderly fashion, and you are making the process as convenient as possible. A Will can avoid potential confusion and conflict by nominating a Personal Representative (PR) who takes responsibility for carrying out the requests of the Will. It can also waive PR Bond requirements and court approval of the PR’s acts, which minimizes expenses. A Will can nominate guardians or trustees for minors, or trustees for beneficiaries who lack maturity to handle valuable assets or are troubled with issues such as chemical dependency. A Will can also set up special trust provisions that may save taxes, preserve assets from being expended on reimbursement to Medicaid, or even affect eligibility for Medicaid. To be eligible for Medicaid, one must pay down their estate to $2,000. If a Will has trust provisions, referred to with various different names such as Special Needs Trust, then an applicant for Medicaid may have assets at their disposal through the trust that will not be counted as being “owned” and part of the $2,000 calculation. Would it make sense for assets of a “healthy spouse/partner,” who unexpectedly dies, to be transferred to a compromised spouse/partner destined to remain in institutional care, when such assets will need to be depleted before Medicaid becomes available? Such assets might also go for reimbursing the state after the applicant’s death when those assets might possibly be given to children or other beneficiaries instead. It is advisable to seek legal advice regarding the execution and terms of a Will, and such documents should be reviewed regularly when circumstances warrant modification of their terms. For those without a Will, Washington State has a formula that directs the passing of assets to either your spouse/partner, your children or your relatives depending on the circumstances of your family situation and whether the assets are separate or community property. A Guardian Ad Litem may be appointed for minor children receiving assets, as the surviving parent may have a conflict of interest in the passing of an asset, such as the family home. The formula used by the state may not be how you wish the assets to be passed. All of these issues can be controlled by a Will. Sometimes called a Survivorship Agreement, the Community Property Agreement in Washington State allows all community property to be passed to a surviving spouse or domestic partner. When a married or registered couple wants their assets to pass to the survivor, they can supplement their Will with such a document. With a Community Property Agreement, the passing of the assets to the surviving spouse/partner can be done without probate in a simpler and less expensive procedure. Some Community Property Agreements have terms that convert separate property into community property to assure the passing of all assets. Legal advice should be obtained before entering into these types of agreements. The probate process begins by the Personal Representative (PR) taking a Will into court, asking a judge to submit the Will to court procedures. If there is no Will, the PR asks the court to open a probate and administer the estate according to statute. Notice of the case must be given to the State and Federal governments, to heirs, to beneficiaries of a Will and to creditors. In most cases creditors are paid, assets are distributed to either the beneficiaries of the Will or heirs of the estate, with receipts signed by all, and the matter is then closed. A process called Small Estate Settlement avoids court hearings for estates of less than $100,000 and without land or buildings. For help in understanding or creating your own Will, managing Small Estate Settlements, and Probates, see Resources: American Bar Association, pg. 63; NOLO – Law for All, pg. 66; Washington Law Help, pg. 66; Washington Probate, pg. 67. You may even choose to begin the distribution of your assets prior to death. In the calendar year 2016, the federal estate tax laws currently allow the gifting of $5,450,000 (adjusted annually for inflation) tax- free either before or after death, and up to $14,000 of assets per gift, per recipient allowed to be given yearly to an individual which won’t even apply to the $5,450,000 limit. States have varying thresholds for gifting at death, and in 2016 Washington State is $2,079,000. In addition, Washington State does not have a gift tax for “during life” transfers, so you can reduce your estate below the taxable limit and avoid this expense. Why not begin to downsize and de-clutter your environment? It will make your Personal Representative’s job easier, and may even result with less stress in your own life. When applying for VA benefits or Medicaid, a myriad of rules come into play and for Medicaid each state is different. Certain assets are considered exempt under Medicaid rules when making application, such as a primary residence or improvements to it, a vehicle, personal property, or burial plans or plots for themselves or family members. A person may choose to “spend down resources” and purchase exempt assets to reach the $2,000 maximum level of assets allowed to be owned when making such an application. It might even be possible to “spend up” such as acquiring a primary home of greater value than what is currently owned. Gifting, although not considered “gifting” in the true sense of the word, may be an additional mechanism available to preserve assets and prepare your eligibility for potential VA or Medicaid benefits. Of course gifting means giving up control, so there is no guarantee that the individual(s) obtaining the gift will use such resources for your benefit. Generally, regarding VA rules, the gift needs to be made prior to the application. For Medicaid, there is a look back period of five years for any gifts given from the date of application. Making such gifts will result in a penalty of a certain period of time of ineligibility. This period of ineligibility could actually be greater than the five year look back period. However, gifting of the family home to a spouse/partner, or to a disabled or minor child, is considered to be exempt from these rules. There are also special rules regarding children who have lived in the home for two years immediately prior to the application, or to siblings residing in and having equity interests in the home. Retirement accounts are an asset deemed available for the limitations, but not such assets when put into a Medicaid qualifying annuity. For all these issues there may be income, capital gains, or gift tax consequences. Seeking an attorney trained in elder care law, a CPA, or professional qualified to guide the applicant is strongly suggested. It’s a wonderful thing to pass on to your family or loved ones assets that may enrich their lives. Wouldn’t it be a shame if your Personal Representative was not aware of such assets, or could not locate them? One last important step to being a good steward is to organize your financial information. We carry in our heads the location of deeds to property and titles to cars, the income tax records, insurance policies and even military discharge papers. Perhaps your spouse/partner knows too. If something suddenly happens to you both, would your Personal Representative know where to find all these records? While it is hard to prove, National Unclaimed Property Administrators asserts “More than one-fourth of all life insurance policy benefits go unclaimed on death of the insured, because family members simply aren’t aware.” They estimate yearly unclaimed benefits run in the hundreds of millions of dollars. Would you want that happening to the beneficiaries of your life insurance policies? From pictures to bank accounts, Facebook to PayPal, we are now storing massive amounts of data and digital assets online and in the cloud. Intentionally we do not want access to these sites to be convenient for many, but we should contemplate the difficulties our survivors might encounter if we were no longer there to help in these final tasks. It is hard enough for ourselves to keep track of passwords, rescue email addresses and information on these accounts. Will our survivors be able to? It is becoming increasingly reasonable to consider naming an online executor and recording your accounts and access information for them in a safe and secure location. Online digital storage businesses and programs offer a complete host of services for organizing and planning for the time you will be gone, including storing letters to be emailed after your death to loved ones, future postings for social media, etc. A good place to start is the US Federal Trade Commission website: www.consumer.ftc.gov and search ‘online life after death’. Additionally, a general search for ‘how to close online accounts’ or ‘how to close online accounts after death’ will produce more than a handful of companies to consider. Regardless of how you plan to provide this secure and personal information for your survivors, it will be important for someone to access online records, close out accounts, blogs, and shut down social media postings to protect your legacy from exposure to potential exploitation resulting from living forever in cyberspace. Resources: Medicaid under U.S. Department of Health and Human Services, pg. 62; National Care Planning Council, pg. 65; National Council on Aging, pg. 65; National Unclaimed Property Administrators, pg. 65; and U.S. Department of Veteran’s Affairs, pg. 62. To have your wishes honored, it just makes sense to complete a Durable Power of Attorney and Will for the security of your estate. ...this is to have succeeded. We plan and direct almost every event in our lives, yet typically ignore the culminating event – our dying. By planning in advance, and discussing with loved ones what is truly wanted directly before and after death, we make our religious, cultural and emotional wishes known in a thoughtful manner. This creates peace of mind, and may ease the trauma for others deciding poten- tially costly issues at a time of emotional crisis. Leaving a written legacy, healing broken relationships and determining final arrangements are important steps toward achieving the “ars moriendi” or good death. Being a good steward of time, talents and treasures as you live day-to-day is important to a life well lived. Adding the stewardship of dying well paves the way for your “ars moriendi” and provides the gift of peace for all concerned. Over 80% of people describe a peaceful death as being at home surrounded by familiar things and people they love, yet over 85% of us die in hospitals or under institutional care. Why? If death occurs at home, must the decedent be immediately removed, or could there be the opportunity for loved ones to gather and grieve together? Death can be a very spiritual moment in time, and the experience for surrounding loved ones, while often sad, can sometimes be a cherished event. Unlike our systematical research for other major purchases, we tend to wait until we are in immediate need to address end of life matters before we determine a budget and act. This limits options and creativity, and puts undue stress and anxiety on those making hard decisions. It will be important for family and friends to add their own touches to create a meaningful and appropriate ceremony celebrating your life, but your input in advance will likely make many decisions easier. Will your remembrance be a true celebration of life, and perhaps might you even have a chance to put the ‘fun’ back into ‘funeral’? In Washington State you have the authority to determine the disposition of your own remains, and HMW encourages all adults to answer the fundamental question of whether or not they want their body buried (interred), cremated, or donated to medical science. You can also choose a representative that will control all issues over funeral ceremonies. 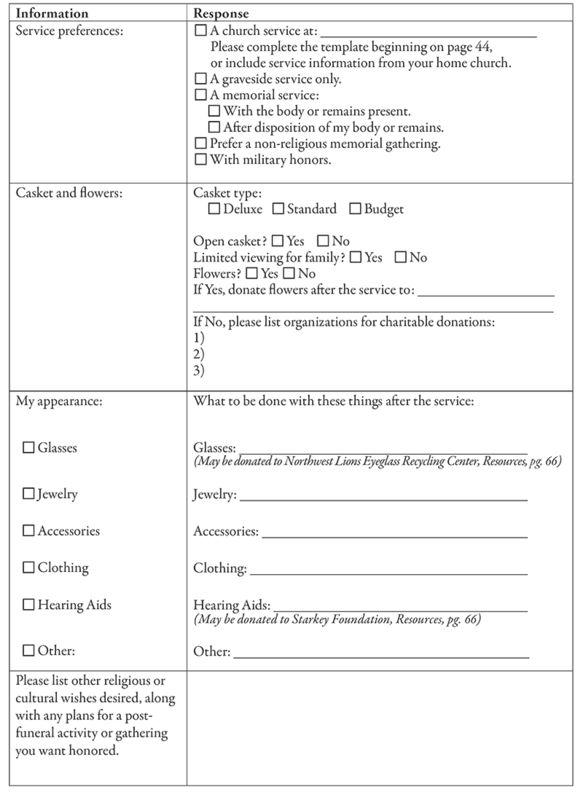 The Body Disposition and Funeral Agent Authorization form at the end of this section controls these decisions. Waiting until death occurs and your family is grieving can result in emotional overspending. Oftentimes with the issues surrounding death, it is difficult to be wise consumers, to check different options or to weigh the value of services versus cost. Giving thought in advance, checking prices and comparing the services of several crematories and/or funeral homes will provide your loved ones with very helpful information. At the time of printing, prices in western Washington begin at $755 for cremation and $1,215 for body burial, depending on crematory and/or funeral home chosen, services and choice of containers. In addition, home funerals, being the historical model, are still an option and are increasing in popularity. Charges for plots and services for churches, halls and/or cemeteries are separate, and vary considerably between public, private or religious facilities. For-Profit Crematories, Funeral Homes and Memorial Societies: Some or all services for final arrangements may be contracted with a crematory or funeral home. This professional service can include handling of the body, completion of the Death Certificate and related paperwork, arrangement for cremations, purchase of an appropriate container and details surrounding arrangements for a service. You are entitled to receive a price quote by phone, and will be provided with a General Price List if you go in person. You are not required to purchase all services offered by a funeral home, and may choose to make or purchase a container from another source. Loved ones may also choose to be responsible for some of the tasks related to the funeral or memorial service such as preparing the obituary. Resources: National Directory of Morticians, pg. 65; National Funeral Directors Association, pg. 65. Non-Profit Memorial or Funeral Consumer Alliances: Established in 1939 to deal with the high cost of burial, these consumer cooperative alliances provide information and education about simple cremation or funeral services available in their area. In some areas they also contract with funeral homes for services discounted up to 66% off standard pricing. Consumer Alliances require a one-time membership fee, which in Washington State is as low as $35.00. Resources: Funeral Consumers Alliance, pg. 64; People’s Memorial Association, pg. 66. Cremation: Cremation is a growing trend, and the majority of human remains in Washington State are cremated. Costs can be minimized greatly, as there is less space needed for burial, and ashes can be scattered for free. There is less need for costly containers, and urns can be rented on a temporary basis. Advantages include more options for the timing of services, as a memorial service may be held without the cremated remains present. Crematories are associated with either funeral homes or cemeteries and their prices vary widely, for basically the same service. Be sure to determine if there is a fee for services and/or the cremation process (retort fee). Cremation costs nothing when making a body donation (see page 16). Resources: Body Donation, pg. 67; Cremation Association of North America, pg. 64. Family Undertaking/Home Funerals: Washington State, under RCW 70.58.240, does allow for families to handle all arrangements concerning final disposition, with the exception of embalming and cremating human remains, and body burial must be in a cemetery. An under- standing of the law and advance planning is necessary as crematories, funeral homes and health care facilities are not generally accustomed to families handling all arrangements themselves. Resources: Home Funerals, pg. 67. Funeral Products: Caskets, coffins, urns and other products are available through a variety of vendors, and your funeral home is required to accept these products with no additional service charges. The circumstances surrounding the death and the location of death will impact decisions regarding how arrangements are handled. HMW offers the following information for Washington State as a guideline to assist in making decisions that fit your personal preferences, but be aware that each county has their own individual regulations and particular way of doing things. The protocol used for your county or even for the individual institutions involved in your case may result in different modalities being chosen. In the populated counties surrounding Puget Sound and Spokane County, the Medical Examiner/ Coroner (ME/C) might be contacted, depending on circumstances, to determine whether to conduct an investigation themselves, or choose to have No Jurisdiction Assumed (NJA) and assign an NJA case number designation. Once the investigation is completed or an NJA is given, the ME/C can then approve the removal of the human remains either by a crematory, funeral home or, the family themselves may move human remains with a Burial Transit Permit. A Death Certificate must be completed. This service is typically performed by the crematory or funeral home, but it can be performed by family members. The attending physician or ME/C must state the cause of death and sign the Death Certificate within 48 hours of death. The Death Certificate must then be filed with the local registrar (generally the county Health Department) within 3 business days of death and prior to permanent disposition of the human remains. Depending on the circumstances, the family can take human remains to a place of final disposition (crematory/cemetery) once a Death Certificate, which includes the Burial Transit Permit, is filed. When a deceased person is received by the funeral industry, the body must either be refrigerated, embalmed, cremated or buried. In Washington State, laws protect the various cultural, religious and personal family preferences for caring of the deceased. If the body is to be cared for by family members prior to cremation or burial, refrigeration must start within 24 hours of death, and can be accomplished simply by using dry ice or frozen sealed packs. Cremation or burial is expected to be accomplished within a “reasonable time” afterwards. 911 must be called, and will initiate the call to the Medical Examiner or Coroner. Do not move the body until the ME/C investigation is complete. If death occurred in a hospital or long-term care facility, family may or may not be allowed to remove human remains depending on local protocol and/or advance arrangements being made. Under hospice care: Hospice staff will declare the death and assist the family with the next steps, including contacting ME/C if necessary. Without hospice care: Either 911 or the attending physician may pronounce the death. ME/C is generally called. The crematory or funeral home may then be contacted for removal of the human remains, or the family may begin private preparations. Medical staff will pronounce the death and assist the family with the next steps. ME/C is generally not called. Institutions expect to release the body as soon as possible. Plans for family to remove the body to a private residence will requite a Death Certificate and Burial Transit Permit, an understanding of the law and working in advance with the institution. Without hospice care: The facility is expected to call 911 or ME/C. If the death was anticipated and a signed POLST or DNR is present, the facility may be able to work directly with the crematory or funeral home of choice for removal of the human remains. Arrangements for family undertaking should be made in advance. Some facilities may not be willing or able to hold the body long enough for family to secure the Death Certificate and Transit Permit. Local cremation is generally the most economical choice, and comparing prices in the area is advisable. The Funeral Consumer Alliance can assist with recommendations, even for nonmembers. Resources: Funeral Consumer Alliance, pg. 64; in Washington State People’s Memorial Association, pg. 66. If body burial is desired, contact a funeral home in your home city and inquire about the cost of “Receiving Remains”, or paying mileage for pick-up. If the human remains have already been taken to a funeral home, inquire of them the price for “Forwarding Remains” and consider using services of a body shipping agency. If the human remains are being shipped by air, ask if there are any used Air Trays or shipping containers for a reduced price. You are not required to purchase more than one casket; pressure to do otherwise should be questioned. In most states it is legal for family to transport human remains; check with the local officials handling Death Certificates. Contact the U.S. Embassy or Consulate in that country; if working from the U.S., contact the Department of State. Resources: U.S. Department of State, pg. 62. If wiring money is needed, work directly with the Department of State. It is generally quicker than working with banks. NOTE: All travelers should include the name of an emergency contact person in the United States on their passport. You may wish to include a note indicating your preference for body disposition. Cremation and donation to medical science is generally much less expensive than transporting human remains back to the United States. Municipal or faith-based cemeteries are less costly than private ones. Caskets may not be mandatory. Most cemeteries require grave liners or vaults for body burial to prevent the ground from settling. Typically, grave liners are less expensive. Urn liners or vaults may be required for burial of cremated remains. Ask about all potential fees and charges to compare prices for headstone, service fees, perpetual care fees, and opening and closing of the grave, columbarium or mausoleum. A Home Cemetery site may be designated in Washington State, provided state licensing requirements are met, including a $25,000 deposit for the purpose of maintaining the site. Permanent easements on the property may reduce future property values. There are special rules for being buried on an island. Resources: Washington State Department of Licensing, pg. 63. Retain the remains in their private possession. Arrange for the crematory or funeral home to dispose of the remains for a fee. Contact the U.S. Department of Veteran’s Affairs to scatter a veteran or dependent at sea. Scatter or bury on private property with permission. Owner retains property use rights. Spread the remains at a designated “Scattering Garden” at the crematory, some cemeteries or churches. Fees are substantially lower than for burial. Bury or inter the remains at a cemetery. Plots for burial, or niches for interment in a columbarium, often accommodate two or more sets of remains. There will be an opening and closing fee for each burial or interment. An urn vault is usually required for burial. Public navigable waters under state control, including Puget Sound, the Pacific Ocean within the 3-mile limit, rivers, streams, and lakes. Resources: Washington State Ferry System, pg. 63. Pacific Ocean beyond the 3-mile limit – these scatterings must be reported within 30 days to the Regional Administrator of U.S. Environmental Protection Agency, Region 10, 1200 Sixth Ave., Seattle, WA 98101. Resources: U.S. Environmental Protection Agency, pg. 62. National Parks: contact the park for permit and regulations. State trust uplands, after receiving permission from the regional manager for each scattering. Scattering by commercial services is not permitted. For a fee, contract with private organizations to scatter cremated remains at sea or in the air. Many individuals interested in protecting the environment are now bringing these values to the final stage of life as well. Referred to as green alternatives because of their minimal impact on the environment, this includes containers used and the type of cemetery chosen. Common chipboard coffins use formaldehyde, and whether cremated or buried disrupt local ecosystems. Biodegradable burial containers, like wicker caskets or burial shrouds, can be found online, and sometimes from funeral directors. Environmentally friendly cemeteries are less common, and may also be researched online. As a consumer driven market, the more citizens request these alternatives, the sooner they will become more readily available. Resources: Green Burial, pg. 67. Best memories of being together. Duplicate prior pages for other deceased relatives as needed. organizations and associations are provided as a convenient starting place for the reader to discover more. Baines, Barry K., M.D., Ethical Wills: Putting Your Values on Paper, 2nd Edition 2006. Barney, Colleen, Esq. and Collins, Victoria, Ph.D., CFP, Best Intentions: Ensuring Your Estate Plan Delivers Both Wealth and Wisdom, Dearborn Trade Publishing, 2012. Bell, Virginia, M.S.W., and Troxel, David, M.P.H., A Dignified Life: The Best Friends Approach to Alzheimer's Care, A Guide for Family Caregivers, Health Communications, Deerfield Beach, Florida, 2002. Byock, Ira, M.D., Dying Well: Peace and Possibilities at the End of Life, Riverhead Books, New York, 1997. Byock, Ira, M.D., The Best Care Possible: A Physician's Quest to Transform Care Through the End of Life, Avery, a member of the Penguin Group (USA) Inc., 2012. Byock, Ira, M.D., The Four Things That Matter Most: A Book About Living, Atria Books, A Division of Simon & Schuster, Inc., New York, 2004, 2014. Callanan, Maggie, and Patricia Kelley, Final Gifts: Understanding the Special Awareness, Needs, and Communications of the Dying, Simon and Schuster Paperbacks, New York, 1992. Carlson, Lisa, Caring for the Dead: Your Final Act of Love: A complete guide for those making funeral arrangements with or without a funeral director, Upper Access, Inc., Hinesburg, VT, 1998. Champlin, Joseph and Peter A. Jarret, C.S.C., Through Death to Life: Preparing to Celebrate the Funeral Mass, 2012. Condon, Gerald M. Esq. and Jeffrey L. Condon Esq., Beyond the Grave: The Right Way and the Wrong Way of Leaving Money to Your Children (and Others); Revised Edition, Harper Business, 2001. Curley, Terence P., Planning the Catholic Funeral, Liturgical Press, 2005. Feldman, David B., P.H.D., and S. Andrew Lasher, Jr., M.D., The End-of-Life Handbook: A Compassionate Guide to Connecting with and Caring for a Dying Loved One, New Harbinger Publications, Inc., Oakland, CA., 2007. Gawade, Atul, Being Mortal, Deckle Edge, 2014. Goodman, Rabbi Arnold M., A Plain Pine Box: A Return to Simple Jewish Funerals and Eternal Traditions, KTAV Publishing House, Inc., 2003. Groves, Richard F., and Klauser, Henriette Anne, The American Book of Dying: Lessons in Healing Spiritual Pain, Celestial Arts, 2005. Hughes, Theodore E. and David Klein, The Executor's Handbook: A Step-by-Step Guide to settling an Estate for Personal R epresentatives, Administrators and Beneficiaries, 4th Edition, 2014. Kelly, David F., Medical Care at the End of Life: A Catholic Perspective, Georgetown University Press, Washington, D.C., 2007. Laderman, Gary, Rest In Peace: A cultural history of death and the funeral home in twentieth-century America, Oxford University Press, 2005. Mitford, Jessica, The American Way of Death Revisited, Vintage Books, A Division of Random House, Inc, New York, 2000. Morgan, Ernest, Dealing Creatively with Death: A manual of death education and simple burial, Upper Access, Inc., Hinesburg, VT, 2010. Morris, Virginia, How to Care For Aging Parents, 3rd Edition, Workman Publishing, New York, 2014. Morris, Virginia, Talking About Death, Workman Publishing, 2004. Plutnick, Charles K., and Leimherg, Stephan R., How to Settle an Estate, 3rd Revised Edition, Penguin Group, New York, 2002. Preston, Thomas A., M.D., Final Victory: Taking Charge of the Last Stages of Life; Facing Death on Your Own Terms, Prima Publishing, Forum, 2000. Prosch, Tim, AARP, The Other Talk: A Guide to Talking with Your Adult Children About the Rest of Your Life, McGraw Hill Education, 2014. Randolph, Mary, J.D., by NOLO Law for All, The Executor's Guide: Settling a Loved One's Estate or Trust, 6th Edition, 2014. Richter, Scott, What to do when someone dies: A simple step-by-step guide for family members, personal representatives and executors, copyright Scott Richter, 2011. Roach, Mary, Stiff: the Curious Lives of Human Cadavers, W.W. Norton & Company, Inc., NY, NY, 2003. Slocum, Joshua, Executive Director Funeral Consumers Alliance, and Carlson, Lisa, Executive Director, Funeral Ethics Organization, Final Rights: Reclaiming the American Way of Death, Upper Access, Inc., 2011. Tobin, Daniel R., M.D. with Karen Lindsey, Peaceful Dying: The Step-by-Step Guide to Preserving Your Dignity, Your Choice, and Your Inner Peace at the End of Life, Based on the N.A.I.C.C. Program Tested in Hospitals, Da Capo Press, a member of Perseus Books Group, copyright by Daniel R. Tobin, 1999.
www.tjcog.org/aging-services.aspx A non-profit government agency, the Triangle J Area Agency on Aging of North Carolina has created a comprehensive website for those caring for individuals at the end of life including links to state specific information. www.eldercare.gov A public service of the U.S. Administration on Community Living (formerly Aging), this resource connects the elderly and their caregivers with sources of information on senior services, and state and local area agencies on aging and community-based organizations. 800.677.1116 (Spanish-speaking Information Specialists available). www.irs.gov 800.829.1040 For assistance with tax preparation for the elderly at the Home Page select 'Help and Resources' under 'Individuals/Filing' select 'Get Free Tax Return Preparation'. matters of consumer protection and provide consumer information for consumers. Funeral Shopping and Planning: From FTC Home Page > 'Tips and Advice' > 'For Consumers' > 'Money and Credit' > 'Shopping and Saving' scroll down to 'Specific Products and Services', then 'Shopping for Funeral Services'. Health of elderly, including advice on nursing homes and care giving, from FTC Home Page > 'Tips and Advice' > 'For Consumers' > 'Health and Fitness' > Healthy Living' under 'Related Items' select 'Health Information for Older People'. Identity Theft and Protection: From FTC Home Page > 'Tips and Advice' > 'For Consumers' > 'Privacy and Identity'. Reverse Mortgages: From FTC Home Page > 'Homes and Mortgages' > 'Home Loans' > scroll down to 'Reverse Mortgages'. www.medicare.gov For all information regarding Medicare; 800.633.4227 (800.MEDICAR) may answer questions about Medicare, policies, insurance fraud and special Medicare beneficiary programs. In Washington State: Aging and Adult Services Administration; www.aasa.dshs.wa.gov/altsa Department of Social and Health Services, P.O. Box 45600, Olympia, WA 98504; 800.422.3263. This agency has a wide range of information regarding Aging, Benefits, Care Giving, In Home Care Insurance, Residential Care, Chronic Illnesses, Functional Disability and more. www.nlm.nih.gov/medlineplus Trusted health information from the National Institutes of Health and produced by the U.S. National Library of Medicine, this website provides information on Health Topics, Drugs and Supplements, Health News, Videos and tools for improving your health. U.S. Administration for Community Living (formerly U.S. Administration on Aging): www.hhs.gov/aging Agency authorizes local agencies to offer a range of programs, services and opportunities for older adults, people with disabilities, their families and caregivers. Also see Eldercare Locator, pg. 61. Health Care Insurance: www.healthcare.gov Official Health Insurance Marketplace. Health and Wellness Information for Older Adults: www.NIHseniorhealth.gov from the National Institutes of Health. Organ Donor Information: www.organdonor.gov Give The Gift of Life. Creating a Family Health History: https://familyhistory.hhs.gov This tool allows you to assemble the information in a format that is secure and easy to share with family and health care providers. Deaths Abroad: The Bureau of Consular Affairs assists families. From the Home Page > scroll down to 'Emergency Information' > 'Injury or Death Abroad'. Office of Overseas Citizens Services for U.S. and Canada call 888.407.4747; abroad call 202.501.4444.
www.va.gov The official site for all information and benefits for Veterans, including Veteran Burial Benefits. www3.epa.gov Information about scattering cremated human remains in open waters, or burial at sea can be searched by region at their website by doing an Advanced Search for 'scattering cremated human remains' or 'burial at sea'. www.uslivingwillregistry.com 800.LIV-WILL (800.548.9455). This privately held organization can electronically store advance directives, organ donor and emergency contact information so they are available to healthcare providers nationally. Five year registration is $59 for single, 10% discount for two or more. disability and survivors benefits to workers and their families and administers the Supplemental Security Income. To find a local office: at the top of the Home Page, select 'Contact Us', followed by 'Find an Office'. www.access.wa.gov provides links to all aspects of living in Washington. www.atg.wa.gov to file a consumer complaint, or call (in state) 800.551.4636, (out of state) 206.464.6684, (hearing impaired) 800.833.6388.
well, licenses, certificates and emergency preparedness, or 800.525.0137. P.O. Box 9012, Olympia, WA. 98507. Phone 360.664.1555. Home cemetery license: from Home Page > 'Professions' > select 'get a professional license' > 'Funeral and Cemeteries' > 'Cemeteries' and 'How to get your license'. Burial and Cremation Information: from Home Page > 'Professions' > select 'more professions' > 'Funeral and Cemeteries' > 'Frequently Asked Questions' > 'Cremation and Cremated Remains' or 'Embalming and Burial'. File a complaint against a funeral home or crematorium: from the Home Page > 'Professions', select 'more professions', and scroll to 'For Consumers' > 'File a Complaint'. Services and dropping of ashes, from the Home Page > 'Other Travel Info' select 'Customer Help Desk: Have a Question?' > 'FAQ's > 'Special Events' scroll down to select 'Memorial Event Scheduling Form', or call 206.264.3556. Scattering is allowed only on runs longer than 25 minutes, and is dependent upon weather conditions. The Captain slows the ferry to allow one family member to scatter the ashes, or toss the biodegradable container intact, into Puget Sound. They may or may not blow the whistle. At the time of this printing the service is provided free of charge, however a nominal fee is being considered. Formerly the National Association of Professional Geriatric Care Managers provides information and referrals for care managers for private hire. From Home Page you can search for national and local resources, professionals and information about Alzheimer's and Dementia, 800.272.3900. This non-profit membership organization of persons age 50 and older is dedicated to addressing their needs and interests. Membership provides a number of good resources and information on health and aging issues for a fee of $16.00 per year. 888.OUR.AARP (888.687.2277). This professional association offers an excellent Consumer Toolkit for Advance Care Planning. The 10 comprehensive Tools include 'How to Have Conversations with Loved Ones', 'Personal Priorities', 'Spiritual Values Important to Your Medical Decisions' and 'After Death Decisions to Think About Now.' From Home Page > 'ABA Groups' > 'Centers and Commissions' and under 'Commissions' select 'Law and Aging' > 'Resources and Research' > 'Health care Decision Making' > 'Tool Kit for Health Care Advance Planning'. This national non-profit organization works to improve care and expand choice at the end of life. Their national, statewide affiliate, or local chapter websites provide general information about end-of-life options and choices. They advocate for better pain management, defend terminally ill patients' rights, promote the use of advance directives and advocate for the legalization of physician aid in dying. They provide volunteers who work one-on-one with patients and families to ensure a peaceful, humane death. All services are free. Nationally: www.compassionandchoices.org 800.247.7421 You can follow the links to locate an organization in your state. Washington State: www.endoflifewa.org 206.256.1636, 877.222.2816. Founded in 1913, this international organization boasts over 1,500 members composed of cemeterians, cremationists, funeral directors, industry suppliers and consultants. Call 312.245.1077 for consumer information and listing of providers in your area. www.cremation.com Cremation resource and provider network website with consumer information about cremation, related news and resources. www.dmachoice.org The business website: thedma.org provides consumer information on how to remove names from marketer's mailing, phone and email lists at the consumer site: www.dmachoice.org. They also provide a Deceased Do Not Contact list (DDNC) that can be completed online. From the Home Page > under 'More Than Just Mail' select 'Register the Deceased'. They also provide an option for caretakers to register family members they are caring for to remove them from commercial marketing lists. DMAchoice, Direct Marketing Association, P.O. Box 643, Carmel, NY, 10512. Based out of northern California, this non-profit organization promotes instruction and facilitation of home funerals. Educational materials are applicable for most states. 707.824.0268. A Federation of Nonprofit Consumer Information Societies. Website provides a listing of nonprofit, nonsectarian organizations across the country that can assist with low cost funeral planning and general news and information for consumers about funerals. 802.865.8300.
www.funeralethics.org Non-profit organization provides state specific consumer information on funeral rights. www.iccfa.com International affiliation of cemeteries, funeral homes, crematoriums and monument retailers. The website contains a Consumer Resource Guide. The ICCFA Consumer Service Council may assist with mediating consumer complaints. www.lcnw.org Serving Alaska, Montana, Northern Idaho and Washington. 877.275.5269.
provides referrals of insurance claims agents for hire to assist in processing health insurance paperwork. A comprehensive resource for Eldercare, Senior Services and Care Planning, including insights on qualifying for Medicaid and Veteran's benefits. Economic and Benefits Check Up RX: www.benefitscheckup.org to go directly, or from the NCOA Home Page > 'Economic Security' > 'Benefits for Seniors' and select button 'See if you're Eligible for Benefits'. The NCOA Provides a screening process to look for federal, state and local resources for older adults. Benefits Check Up helps you learn about and enroll in public and private programs that can save you money on health care and prescription drug costs. There are also tips on finding work, cutting spending, reducing debt and using home equity. If you qualify for the Extra help / Low Income subsidy, the site will link you to Social Security Administration's (SSA) web site to complete an online application. Home Equity Advisor: From the NCOA Home Page > 'Economic Security' > 'Home Equity' for topics to help older adults age in place. My Medicare Matters: www.mymedicarematters.org to go directly, or from the NCOA Home Page > 'Economic Security' > 'Benefits for Seniors' > 'Original Medicare' > select 'Where to get additional assistance'. This educational service of the NCOA provides information about Medicare coverage, applying and understanding what is best for you, including links to certified advisors. The "Red Book" funeral home directory is a complete listing of licensed mortuary and funeral home establishments. association. The 'For the Public' tab on their Home Page provides consumer information on planning a funeral, locating a funeral home and a 'Funeral Service Help Line'; 800.228.6332. This is the national non-profit organization of hospice and palliative care programs in the United States. The NHPCO website provides professional information and links to NHPCO's consumer resources at Caring Connections, www.caringinfo.org This site provides links for state specific Advance Directives, educational information about dying, hospice care and living well without pain, as well as a consumer helpline: 800.658.8898, or multilingual line: 877.658.8896.
www.unclaimed.org Home Page allows you to search most unclaimed property records by state or Canadian province. www.nolo.com Publisher of do-it-yourself legal books and software, formerly known as Nolo Press. Website provides a search process for attorneys as well as some free legal advice including state-specific medical directives, information on wills, estate planning and final arrangements. Northwest Lions Eyeglass Recycling Center (NWLERC) : www.lionsnwlerc.org Founded by area Lions Clubs they provide used glasses free of charge to people in remote areas of developing countries. Donation boxes are located throughout the community at eye care centers, businesses and workplaces of Lions members. For a location near you, from the NWLERC Home Page > 'Donate Eye Glasses'. <>liLions Hearing Bank : Lions Club provides refurbished hearing aids to low income residents who qualify. For an application, from the NW Lions Foundation for Sight and Hearing Home Page > 'Hearing' > download the application and instruction. A Washington based non-profit organization promoting consumer advocacy and choice for end-of-life final arrangements. People's conducts a price survey of funeral services in Washington and provides a wealth of consumer educational information at their website. The $35 one-time fee provides members with access to People's Member Funeral home, or to contracted funeral homes providing discounted services. 1801 12th Ave., Suite A, Seattle, WA 98122, 206.325.0489 or 866.325.0489.
www.gundersenhealth.org/respecting-choices Provides training, technical assistance and materials to individuals, organizations and communities wishing to improve community education and preparation of Advance Directives. Gundersen Lutheran, Franciscan Skemp Healthcare, Mayo Health System, 700 West Ave. South, La Crosse, WI. 54601; Director of Ethics, 800.362.9567, ext. 55279.
www.selectedfuneralhomes.org An international association of independent funeral providers who have agreed to follow strict standards of ethical practice. The website provides consumer information on a wide variety of topics related to final arrangements, including religious customs. International non-profit foundation dedicated to providing refurbished used hearing aids to people around the world. For their recycling program and instructions for sending your used hearing aids from the Home Page > 'Hearing Aid Recycling Program'. 866.354.3254. The Conversation Project is dedicated to helping people talk about their end-of-life care wishes. They provide information and tools for having and recording conversations. www.washingtonlawhelp.org This non-profit provides free civil legal services for low income persons and seniors in Washington State, and legal education materials and tools at their website. From the Home Page > 'Understand Your Legal Issue' > 'Seniors' > and select your topic. This site can help you with doing your own will, completing the administration of small estates and completing probates with forms and instructions. Provides POLST information brochure and advance directives online from the Home Page select 'please visit our POLST for patients page', or write to 2033 6th Ave. Suite 1100, Seattle, WA. 98121. 800.552.0612. National Hospice and Palliative Care Organization, pg. 65. NOLO-Law for All, pg. 66. Washington State Medical Association, pg. 67. Honor My Wishes recommends you take time to learn about the options available, research the organization's reputation, and discuss your decisions with your loved ones if you choose to donate your body to medical science and research. For more information do a search online for "willed body donation" or "whole body donation." University of Washington Willed Body Program: Dept. of Biological Structure 206.543.1860. Washington State University Body Donation Program: 509.368.6600.
www.anatbd.acb.med.ufl.edu and select 'US Programs'. Peoples Memorial Association: Go to 'Funeral Education' > Green Info. Undertaken With Love - tools and resources for groups and parish committees. For general information and resources related to hospice and end of life issues see National Hospice and Palliative Care Organization at pg. 65. Federal Trade Commission (FTC): www.ftc.gov From FTC Home Page > 'Tips and Advice' > 'For Consumers' > 'Privacy and Identity'. www.polst.org National organization promoting POLST education and utilization for appropriate individuals. Find links to your state programs under 'Programs in your State'. Washington State:www.lcnw.org 877.275.5269, or say 'yes' to organ donation when renewing your driver's license in Washington State. Donate Life America: www.donatelife.net for your state's donor programs. 804.377.3580. These are more of an emotional and philosophical record of an individual's life, and provides wisdom and reflections on life to leave as a legacy for future generations. They represent a sort of "spiritual estate" to pass on. These letters are an opportunity to share our roots and why we chose one path or direction over another. For help in understanding and doing your own Wills, completing the administration of Small Estates and completing probates, you can find forms and instructions for free at www.Wa-Probate.com or www.WashingtonLawHelp.org There are a number of resources available online by doing a search for "Do it yourself Wills." An illness having a rapid onset, severe symptoms and a short course. A male individual appointed by the court to carry out the Probate process as the Personal Representative, when such person is not nominated by the decedent as Executor in the Will, or when there is no Will. A female individual appointed by the court to carry out the Probate process as the Personal Representative, when such person is not nominated by the decedent as Executrix in the Will, or when there is no Will. anticipation of the potential need for medical treatment. A person who is designated by you with a power of attorney to make decisions on your behalf. These decisions can involve financial or health care issues, depending on the document. Also known as Proxy, Surrogate Decision-Maker or Representative. A receptacle, usually unfinished and without ornamentation, which is lower in costs than a casket. The donation of one's body parts and/or body for transplant or research purposes. Instructions should be discussed with family and documented appropriately. Commonly refers to mechanical equipment or procedures required to maintain the bodily functions of an individual who would otherwise die without such intervention. Food and/or fluids supplied through tubes or intravenous lines and not taken in voluntarily by mouth. One who is designated in a Will to receive property. Final disposition of one's remains in the ground. Also known as interment. Small stack of rocks marking a safe path to follow. The ability to understand the nature and risk of a decision affecting your person or estate, or the attributes of an individual that enables them to perform certain acts. The heart has stopped beating. Cardiac arrest will cause lasting brain damage and death unless the heart resumes beating within a few minutes. breathing and/or heart has stopped. A disease process that persists and usually worsens over a long period of time. A document executed with the same formalities of a Will that modifies or revokes part of a previous Will. An aboveground structure containing individual niches for the disposition of cremated human remains. An unconscious condition. This condition may be temporary or permanent. A brief graveside ceremony held before the casket or urn of cremated human remains are laid to rest. which may establish and/or change the character of property to either separate or community property and transfers property upon death, avoiding probate. See Survivorship Agreement. The state of being qualified, suitable or adequately skilled for the purposes mentioned. The quality or condition of being legally eligible or admissible. The remaining ash and bone fragments from cremation of human remains. processed to a uniform size and consistency. This is performed at licensed crematories. The cremated human remains can be buried, entombed, scattered or retained by the family. An institution that performs cremations, and can sometimes offer services and the scattering of cremated human remains. The ability to understand the basic nature and risk of a personal health care decision. The name of a specific disease or medical condition. memorial service either before or after. the Natural Death Act in 1992, the law terminology was changed to Health Care Directive. Refers to a legal document, signed by both the patient and their provider, stating a desire not to have CPR initiated in the case of a cardiac event. This form was replaced in 2003 with the Physician Orders for Life-Sustaining Treatment. See POLST. A Power of Attorney that does not become void upon the incapacity of the principal. See Power of Attorney. documents are durable by their nature. The process of removing bodily fluids and replacing them with a preservative to temporarily delay the decomposing of the deceased. This process is not mandatory, but it allows for a delay in services to accommodate family and others in their arrival plans. Placement of a body in a casket in an aboveground structure called a mausoleum. The interest one has in any type of property, both personal and realty, and liabilities. Taxes due to the Federal Government upon death. See Inheritance Tax. A statement, letter or essay about one's reflections on the meaning of their life and messages they would like to pass on to others about what they valued, lived for and treasured in this life. Also referred to as a Spiritual Will. A male person appointed by a testator / testatrix to carry out the terms of a Will. A female person appointed by a testator / testatrix to carry out the terms of a Will. Service or ceremony conducted to honor the life of the deceased person at which the body is generally present. These not-for-profit consumer cooperative alliances provide information and education for their members about simple cremation or funeral services available in their area. Some alliances are able to contract with selected funeral homes, and their members may receive as much as a 66% savings over standard prices. Generally operated by a volunteer board and require a one-time low-cost membership fee. Originally began as not-for-profit organizations of consumers, however the name "memorial" has been added to a number of for-profit funeral service providers in an effort to enter into the market share of consumers interested in low-cost funeral services. Consumers should ask and compare prices and services. A concrete, metal or fiberglass protector for a casket placed in the ground at a cemetery. If the casket is completely enclosed by this device, it is also known as a vault. Many cemeteries require liners because they help to stabilize the gravesite, preventing settling of the earth above the casket. A guardian is a court ordered individual who has the power and the responsibility of taking care of another person and/or managing the property and affairs of that person. Abbreviation for the HMW "Health Care Power of Attorney and Directive". written by you tells your doctor what you want or do not want if you are diagnosed as being terminally ill and in a persistent vegetative state or in a permanently unconscious condition. While helpful in a few situations, it is not as effective as a Power of Attorney for Health Care. Doctor, Advanced Registered Nurse Practitioner (ARNP), Nurse Practitioner, Physician Assistant, Hospital, Nursing Home, Skilled Nursing Facility, Rehabilitation Centers, Boarding Home or Adult Family Home. See Power of Attorney for Health Care. Those individuals who are entitled to receive assets in the absence of a Will. A Will written entirely in the testator's handwriting. This still must comply with all the formalities of a typewritten Will in Washington State, but other states may differ. Refers to the payment of a fee to persons assisting with the Funeral or Memorial Service, and may include the clergy, musicians, soloists or organizations providing refreshments following the ceremony. Typically there are six individuals named as pallbearers for a service. Oftentimes there are more individuals than are needed, or friends who are unable to bear the weight of a casket. These individuals are given the distinction of honorary pallbearers. Health care designed to give the terminally ill person comfort and support at the end stages of living. Hospice care can be provided at home or other care settings. A physician must certify the individual may have less than six months to live if the disease process advances in its normal pattern, however it is not uncommon for individuals to receive hospice care for much longer periods of time. To provide the body with fluids. The lack of capacity, or not being capacitated. See Capacity/Capacitated. The purpose of the suggested treatment. Why the treatment is being suggested for you. What the treatment is expected to do for your condition. What result is expected if you choose to have treatment. What result is expected if you choose not to have the treatment. Other possible treatments that you could choose, and the risks and benefits. Taxes due to the State upon death. See Estate Tax. To place a deceased body into the ground or tomb. When a person dies without a Will. Intestacy. The laws of intestate succession control the distribution of the decedent's property. See Testate. The insertion of a tube into the larynx via the mouth or through an incision in the throat. This is accompanied with mechanical breathing provided by either a machine (respirator), or manually with a hand bag. A medical condition that cannot be corrected by treatment. so that if any one of the joint tenants dies, the remainder of the property is transferred to the survivors. A person who inherits a legacy, which is money or property handed down by a Will or from an ancestor. Comparable to Letters Testamentary, only issued to an Administrator. A document issued by a court acknowledging that a Personal Representative has been granted the powers to carry out the functions necessary to administer an Estate in Probate. Any medical treatment used to prolong biological life. These may include but are not limited to: CPR, Respirator / Ventilator, Artificial Nutrition and Hydration, Kidney Dialysis and Antibiotics. A trust that passes property upon death which is used in place of a Will, avoiding the need for probate. This is a useful document if real property is held in multiple states, or if privacy is a concern. An aboveground building in a cemetery with individual slots for placement of caskets. The front is usually sealed and faced with stone. Refers to a service or ceremony conducted to honor the life of the deceased person when the body or cremated human remains are not present. urn or box is placed inside the compartment and the front is sealed with either glass, allowing viewing, or with bronze, marble or stone. Abbreviation for "no jurisdiction assumed" used when the Medical Examiner / Coroner decides to not conduct an investigation on a death and then issues a NJA number. Refers to a physician's orders not to use CPR in the event the person experiences cardiac arrest. Property that can pass by terms other than as expressed in a Will, such as Life Insurance or joint tenancy accounts held with rights of survivorship. Formal announcement of the death of an individual placed in the newspaper. The obituary often summarizes the person's life, gives information about surviving family, any service that is planned and suggestions for contributions to be made in memory of the individual. The individuals, usually six, who are responsible for transporting the casket from the hearse to the church and back, and/or to the cemetery. Supportive medical care that relieves the symptoms of the illness and reduces pain, but does not aggressively seek to cure the illness. This care is normally provided for people in terminal and/ or incurable conditions. Federal law passed in 1990 requiring health care providers to give you information about Advance Directives and making health care decisions at the end stage of life. A term used to denote how property will pass if a beneficiary predeceases the person they are to inherit from, which requires the property to pass to the surviving siblings of the beneficiary. A term used to denote how property will pass if a beneficiary predeceases the person they are to inherit from, which requires the property to pass to the children of the beneficiary. The PR is appointed by the court to handle the estate, either performing the Will's directives, or administering the estate if there is no Will. See Executor / Executrix; Administrator. A legal document that names another person who can sign your name when formally required to, such as for contracts, deeds, etc. health care decisions for you either presently or in the event you are unable. Because it is usually written to be effective for when you are unable to make decisions for yourself, it is generally Durable by nature. This document is the most powerful tool for protecting your wishes for end of life care treatment. Practitioner or Physician Assistant who is usually responsible for treating you for your health care. One who signs a document. The court procedure for handling an estate of a deceased person. It can prove the validity of a Will and carrying out its directions, or if there is no Will it can administer the estate according to state laws. A Probate Bond may be required by the court to be posted to assure the performance of a Personal Representative's duties and acts. If the PR fails in their duties and incurs a liability to beneficiaries or creditors, the bond can be used to offset losses. A Probate Bond can be waived by a Will. The probable outcome of a disease based on the condition of the person and the usual course of the disease. Revised Code of Washington, which are the laws and statutes for the state. Medical machine used to improve or maintain a person's breathing. The name for the process of incinerating human remains in cremation. For jointly held property upon one party's death, the deceased owner's share will automatically pass to the survivor. Another term for Community Property Agreement. A Will can refer to another document that directs the disposition of certain items. This type of property can include such items as jewelry, furniture, etc. and does not include items such as land, money, monetary account, or assets with titles like cars. This type of document is useful as a Will does not need to be modified each time there is a minor change in the distribution of such items. An incurable illness that will cause death. When a person dies with a Will. The Will controls management and disposition of a person's estate at death. A male person who signs a Will. A female person who signs a Will. The small vase-like container or box specially designed to hold cremated human remains. A scheduled time for family and friends to view the deceased decedent. A document signed and dated by a testator / testatrix, attested to by two competent witnesses, that controls the disposition of property upon death. A Will may also name a Personal Representative, nominate guardians, and set up trust provisions. An identifiable and specific time in a day, night or week that an individual exhibits the ability to understand the nature and risk of a personal health care decision.